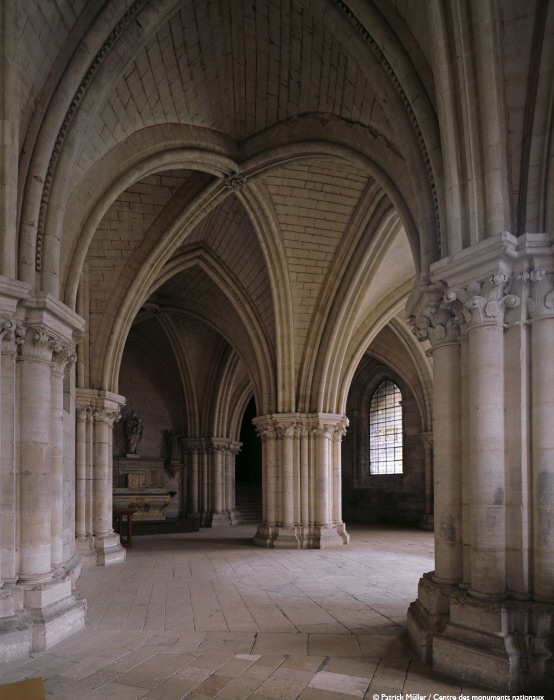 The crypt of Bourges Cathedral is not underground (as its name would suggest), but instead forms the base of the cathedral’s choir, to compensate for a height difference of 6 metres. Building work began on the crypt in 1195. It is bathed in light, and reflects the layout of the choir situated above. It was used as a workshop for stonemasons during the construction of the building. Since 1994, the “crypt” has housed fragments of the cathedral’s rood screen. The rood screen was built in the 13th century, initially separating the nave (open to worshippers) from the choir (reserved for clergy only). The upper section featured an illustrated rendition of the Passion and Resurrection of Christ. It was removed in 1758 to encourage greater participation from worshippers. The tomb of John, Duke of Berry (1340-1416) can be seen in the centre of the crypt. Designed by Jean de Cambrai, the white marble recumbent statue rests on a slab of black marble. The lower section of the cenotaph was severely damaged during the French Revolution. It was originally installed in the Sainte-Chapelle chapel at Bourges. The chapel was destroyed in 1757, but its stained glass windows can now be seen in the crypt. The rotunda, in the centre, features a vast entombment scene (16th century) donated by canon Jacques Dubreuil. It also houses the tombs of every bishop of Bourges who has died since the French Revolution.